Santa Barbara, Calif., September 21, 2018 – Transcranial Magnetic Stimulation (TMS) therapy is rapidly growing in popularity as a treatment for many neurological and mood disorders, and the cutting-edge medical technology recently reached another major milestone that should accelerate demand for the non-drug treatment option. The US Food and Drug Administration (FDA) announced in August that it had approved TMS to be marketed as a treatment for obsessive compulsive disorder (OCD). The FDA previously permitted marketing TMS as a treatment for major depression in 2008 and expanded the use to include TMS for treating pain associated with certain migraine headaches in 2013. Click here to read the full news release from the FDA. To learn more about TMS therapy and other treatments offered at the TheraMind Center of Santa Barbara, call (805) 845-4455 or visit tmsmind.com/santabarbara-ca. The TheraMind Center of Santa Barbara is committed to improving the lives of patients by providing physicians with the most advanced therapeutic, non-drug alternatives for treating a broad variety of neurological and behavioral disorders. Our doctors successfully treat patients suffering from treatment-resistant depression (TRD), Major Depressive Disorder (MDD), Anxiety Disorder, Post-Traumatic Stress Disorder (PTSD), Bipolar Disorder, Obsessive Compulsive Disorder (OCD) and other mood disorders. The Center also routinely treats patients suffering from a variety of neurological disorders including Chronic Pain, Fibromyalgia, Migraines, Tinnitus, Stroke-related disorders, Concussion and TBI, and others. We employ advanced diagnostic technologies such as fMRI and genetic testing to assist our physicians and referring medical professionals in assessing patient needs. Our highly-trained staff members are committed to providing outstanding supporting services to referring medical professionals, their patients and the patients’ family members. 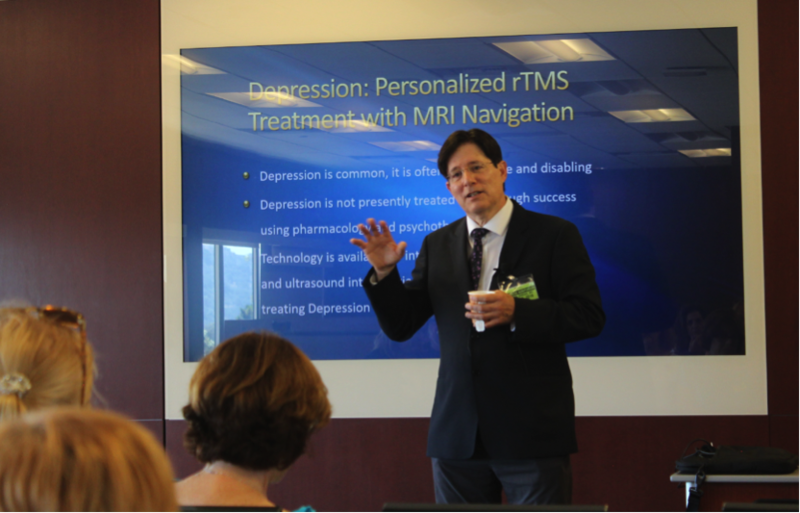 Santa Barbara, Calif., August 16, 2018 – Dr. Sheldon Jordan, MD, FAAN is widely recognized as a leader in brain imaging using functional magnetic resonance imaging (fMRI) and Transcranial Magnetic Stimulation (TMS) targeting techniques to treat Major Depressive Disorder and other neurological and psychological disorders. On Wednesday, August 8th, Dr. Jordan presented to a group of doctors, nurses, and community members at Santa Barbara Cottage Hospital as part of their monthly Psychiatric Grand Rounds, hosted by the Department of Psychiatry and Addiction Medicine at Santa Barbara Cottage Hospital. These presentations are meant to introduce clinicians to recent advances that enhance treatment and provide a forum for discussion of topics that strengthen the relationship of psychiatry and addiction medicine to the broader Santa Barbara community. A group of about 50 people gathered in Santa Barbara Cottage Hospital’s Burtness Auditorium to learn about TMS and how it can be used to treat depression, anxiety, and other mood disorders. TMS therapy, an FDA-cleared, non-invasive treatment, employs MRI-strength magnetic impulses targeted to specific regions of the brain involved in the regulation of mood. Dr. Jordan touched on the fact that every person’s situation is unique, and that depression often works in combination with a number of other disorders, such as anxiety and rumination. Dr. Jordan has been in private practice in West Hollywood and Santa Monica since 1981, with an emphasis on interventional pain management, neuroimaging, clinical neurophysiology, and sports neurology. He currently oversees the administration of TMS therapy for patients at the TheraMind Center of Santa Monica. Alpine skier, Mikaela Shiffrin, told The Washington Post, “…the hardest thing about the Olympics is the incredible emotional valley you feel after it. What is my life meant for, now that the Olympics is over. That’s kind of what it feels like.” Olympic athletes have long talked about the difficulty of coming down off their competitive highs. Visit The Washington Post to read the complete March 28, 2018 article. Do you have mental health struggles? Are you battling with depression and looking for hope? Find out if TMS Therapy is right for you. The new Hyperbaric Oxygen Therapy (HBOT) offered at TheraMind Center of Santa Barbara was recently featured in two online publications, Amigos805.com and Noozhawk. Both articles announce the expansion of HBOT services with the addition of a second mild HBOT (mHBOT). mHBOT is a non-invasive, FDA-cleared therapy that allows patients to breathe pure oxygen inside a flexible, soft-sided chamber under pressures, similar to diving to the bottom of a 10 ft deep swimming pool. This type of therapy was originally used to treat mountain climbers suffering from altitude sickness, but now has expanded to successfully treat traumatic brain injury (TBI), concussions, inflammation and aid in post-stroke recovery. The doctors and certified specialists at TheraMind Center of Santa Barbara use mHBOT, supported by advanced diagnostic technologies like fMRI and genetic testing, to treat patients suffering from a broad range of neurological disorders, including migraines, concussions, TBI, neuropathy, certain autism spectrum disorders and some behavioral conditions such as depression. Other medical applications include generalized immune system enhancements, and the treatment of neurodegenerative disorders, such as Parkinson’s early state Alzheimer’s, dementia, memory loss, chronic fatigue syndrome, fibromyalgia, and Lyme disease. To read the complete new articles, visit Amigos805.com or Noozhawk. Low Level Light (or Laser) Therapy, also sometimes referred to as “Phototherapy”, was the subject of a recent study that sought to compare the effects of red and infrared LLLT on skeletal muscle fatigue in humans. A randomized double-blind placebo-controlled crossover trial was performed on 10 healthy male volunteers. They were treated with active red LLLT (660nm) and active infrared LLLT (830nm) or an identical placebo at identical locations before exercise. The study concluded that both red LLLT and infrared LLLT therapy were significantly better in delaying muscle fatigue than placebo and, further, that there was no significant difference in result between the two active LLLT therapies. A full discussion of the study parameters and results can be found at www.ncbi.nlm.nih.gov. Hyperbaric Oxygen Therapy (HBOT) was recently used in combination with metabolically supported chemotherapy (MSCT), ketogenic diet (KD) and hyperthermia (HT) to treat a 29-year old patient with Stage IV Triple-Negative Breast Cancer (TNBC). The patient was admitted to the hospital in Istanbul, Turkey in October, 2016, where a whole body PET-CT scan revealed a primary tumor in her left breast, multiple left pectoral and axillary lymph nodes, multiple widespread liver masses, and an upper left nodular abdominal lesion. Following a treatment protocol consisting of MSCT, KD HT and HBOT, a follow-up full body PET-CT scan in February, 2017 showed a complete therapeutic response with no evidence of abnormal FDG uptake. The treatment protocol above was continued until April, 2017 when the patient underwent a mastectomy which revealed a complete pathological response consistent with the PET-CT scan imaging. The complete report can be seen at: www.ncbi.nlm.nih.gov. On June 12, 2017, TheraMind Center of Santa Barbara announced our role in a collaborative clinical research project with Westmont College. This Independent Review Board (IRB) approved study, under the direction of Westmont’s neuropsychopharmacologist, Dr. Ronald See, aims to evaluate the proportional levels of certain salivary substrates throughout a typical course of repetitive Transcranial Magnetic Stimulation (rTMS), one of the primary treatment modalities used at our Center. Despite rapid advances in rTMS as a viable therapy for drug-resistant Major Depressive Disorder (MDD), understanding of the fundamental biomechanisms of rTMS and its key clinical effects are limited. The physiological measures which are the subjects of this clinical study have been shown to be linked to affective regulation, stress-responses, and autonomic nervous system activity. Previous studies have sought unsuccessfully to establish reliable biomarkers for the identification of neurobiological correlates of rTMS administration. The study being sponsored by Westmont College and the TheraMind Center of Santa Barbara hypothesizes that these salivary substrates may act as reliable biomarkers for repetitive transcranial magnetic stimulation rTMS treatment outcomes. If proven, the study will be a significant tool for clinicians in their efforts to effectively treat patients suffering from depression. The TheraMind Center of Santa Barbara is a unique outpatient clinic providing a combination of advanced diagnostic and neuroimaging technologies, cutting edge neuromodulation technologies including rTMS, hyperbaric oxygen therapy (HBOT), low level light therapy and PEMF, as well as body-based services. Our board certified and licensed medical professionals promote mental and neurological health through an integrative model designing individual treatment protocols for our patients. We work collaboratively as mutual referrals and adjuncts to local medical professionals for the greatest benefit to our patients. We service four primary demographics: (1) those suffering from depression, anxiety, OCD, PTSD and other mood disorders, (2) chronic pain and migraines, (3) traumatic brain injury and concussion, and (4) stroke. For questions regarding our collaborative project or to make an appointment, please contact us via phone at (805)-845-4455 or via email at beusebio@tmsmind.com. We are enthusiastic about discussing the details of this study, the research behind it, referrals for patients / participants, or any other pertinent matters. Transcranial magnetic stimulations (TMS) is featured in this month’s Oprah “O” Magazine titled, “A Twinge of Relief”. The article notes the 2008 FDA approval of TMS for mildly treatment-resistant depression and outlines standard treatment information by Dr. Stephen Taylor, MD and professor of psychiatry at the University of Michigan. With May being Depression Awareness month, Greatday Houston, a daily KHOU talk show, featured NeuroStar TMS Depression Therapy on their May 18, 2015 Medical Monday series. Guests included Dr. Cathy Hart, Medical Director of a local TMS Therapy Center, and a Greatday Houston viewer who had tried this new depression treatment. Dr. Hart explained how magnetic therapy works, a no pills and no surgery depression treatment, while the guest explained her struggles with depression and her TMS Therapy success story. View the show. This month, Fox 40, WFTX-TV in Fort Myers, Florida featured special news coverage on TMS therapy and one women’s life changing experience. The special report was called “Latest Technology ‘Zaps’ Depression”. Diagnosed at 13 with medical depression, Jessica felt isolated, constant sadness and contemplated suicide. She wanted to share her story of struggle and success to hopefully inspire others. After the day-to-day struggles and trying so many different medications, her doctor felt she was a good candidate for TMS therapy. Jessica mentioned that the beauty of the treatment was that it didn’t hurt, there were no side affects and it truly changed her life. Read or listen to her story. NewsChannel 3 in Virginia recently featured a medical segment on treating depression without drugs. The special, “Can Depression Be Treated Without Drugs?” documented a 35-year old patient and local newspaper reporter from Peninsula who suffered from depression most of her adult life, including battles with social anxiety, phobia and paranioa. Finally, she discovered a doctor in Virginia Beach who was using TMS therapy. After six weeks of weekly treatments, she was able to get back to her normal life and do one of her favorite things again, writing. Read or listen to the whole story. WOSU, an Ohio State University radio station, recently featured Transcranial Magnetic Stimulation, TMS, as a new depression treatment option that is showing success among some who have struggled with mental illness for years. The show and article highlights one patient’s experience with TMS therapy after suffering from depression for over 13 years. Mr. Jefferys used drug therapy and counseling for years but at one point attempted suicide. Finally, at 48, he learned about TMS therapy. Read or listen to his TMS success story.